Right now I am trying to find some ethically acceptable filling for a 200 x 220 cm summer duvet and a sleeping bag. I already found pattern and tutorial for the sleeping bag (in Swedish). Down seemed like a good idea until I visited the Swedish Animal Rights association and read about down being plucked from living animals. If your okay with wool I found ecological pillows with wool filling (455SEK + freight) also available at Ullbutiken. Kapok is difficult to spin but is used as an alternative to down as filling in mattresses, pillows, upholstery, zafus, and stuffed toys such as teddy bears, and for insulation. Source: “Ceiba pentandra.” Wikipedia, The Free Encyclopedia. Sold at Lotus Design non-eco? per kg (not in stock during writing). I have no idea how warm this is. Has anybody tried this in a blanket? Can also be bought non-eco by the bale direct from China. 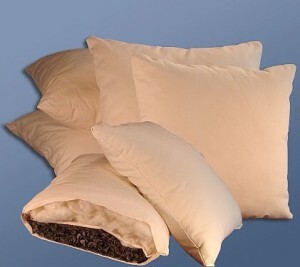 White Lotus in the U.S.A. sells eco-pillows filled with kapok. Through amazon.co.uk PERFECT PILLOW sells organic kapok for stuffing at 12£ / kg and a duvet is also availible there for 286£. Swedish note: Kapok kan certifieras med bra miljöval om Fair Wild Foundations regler följts vid indsamlingen. Sold at Lotus Design in blocks coated with latex (not in stock during writing). I have no idea how warm or soft this is. Has anybody tried this?